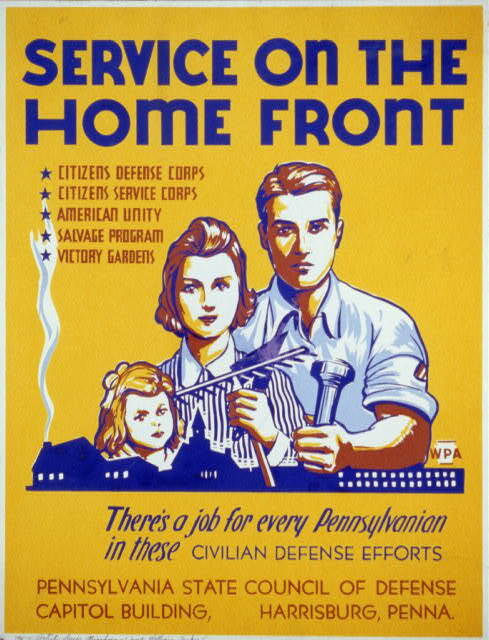 Title: Service on the home front There's a job for every Pennsylvanian in these civilian defense efforts. Summary: Poster encouraging participation in civil defense efforts, showing family prepared for work. Caption continues with list of civilian defense opportunities: Citizens Defense Corps, Citizens Service Corps, American Unity, Salvage Program, Victory Gardens. Hand-written in pencil on recto: Artist: Louis Hirshman and William Tasker.